Since the August 2017 update, you can re-use colors and character styles that you created with other Adobe tools like Photoshop or Illustrator and saved in your Creative Cloude Libraries. To open the Creative Cloud libraries panel in Adobe XD, select File > Open CC Libraries on Mac, or Menu icon > Open CC Libraries on Windows. 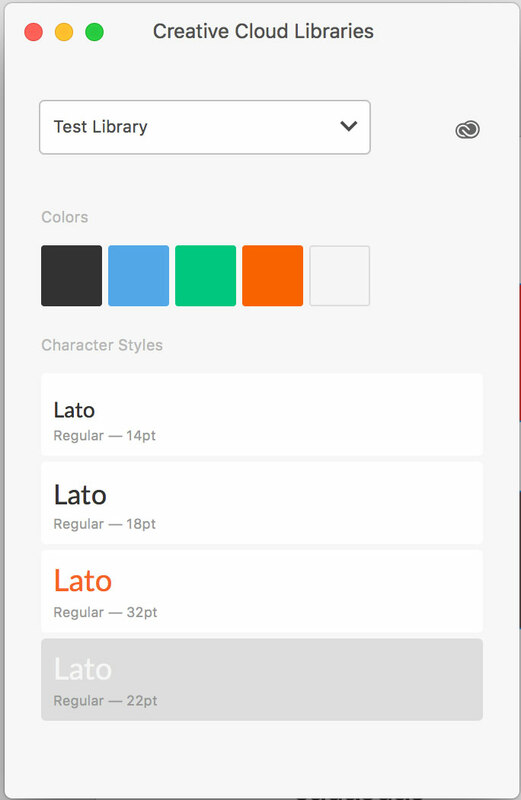 From the dropdown menu on top you can select which CC Library you want to pull colors and character styles from. All the saved assets will be displayed right away. You can easily apply the colors and characters saved in your CC Library to new or existing objects included in your XD document. • To apply a fill color, just select an object and then click on the color you want to apply in the CC Library panel. The fill of the object will be instantly changed to the new color. You can do the same thing by right clicking on the color thumbnail in the CC Library panel and selecting “Apply as fill“. • To apply a border color to an object, select it, right click on the color thumbnail in the CC Library panel and select “Apply as border“. • To apply a character style, just select a text object in your document and then click on the character styles you want to apply in the CC Library panel. The font style of the selected object will be instantly changed. Important note: At the moment you cannot add or edit assets in your CC Libraries from Adobe XD.